Last March, I enjoyed trying the "Boniato (Ipomoea batatas, also known as tropical sweet potato, batatas, and camote), said to taste and look like a cross between baked and sweet potato, being drier and less sweet than sweet potatoes we commonly eat in the U.S." After baking it at 400°F for about an hour, I enjoyed the soft flesh that reminded me of chestnuts in flavor. 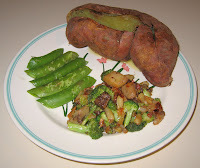 Today I prepared it the same way, and found it to taste more like a sweet potato. 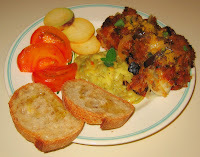 I also served English peas and made an interesting side dish. I sauteed broccoli, onion, and chunks of white eggplant; when it was done, I mixed some tahini in, as well as a little salt. It came out great! We really enjoyed this dish - the white eggplant tasted sweeter to us. A few days ago, I picked up a thin little sea vegetable called seabean (or pousse-pierre, sea green bean, or sea pickle). I know that sea vegetables are quite nutritious, but I generally don't like them as they're salty and often fishy smelling and tasting. But I thought I would try these little vegetables. I simply sauteed thinly sliced elephant garlic for a few minutes, then added green beans. A few minutes later, I added the seabeans and cooked just for a minute or two. 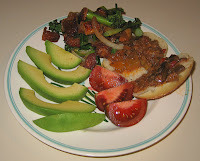 I also served a stack of sauteed portabello mushroom, slice of onion, and poato. 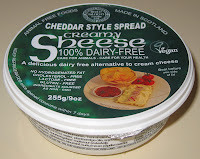 Great n ews; my favorite vegan cheese, Scotland's Isle of Bute Foods, now has a spreadable "cream cheese". The U.S. distributor contacted me late last week to ask if I'd like to sample it. Today, I received several flavors, and opened the cheddar. It's very good! It has a good flavor, definitely reminiscent of cheddar cheese, and has a good spreading consistency. I put some on an English muffin half and served with fresh tomato; later, I added a little to several potato slices - it was quite good. My wife loved dinner. I thought it was good, but the seabeans were salty. Tonight, I showed my cooking class how to work with filo dough; many were already somewhat familiar with using this ingredient that needs to be kept from drying out, and all seemed to be excited to be working with it! One team of four made spanakopita, and the other team of four made chocolate baklava. We also had baba ganouj (made with eggplant) and hummus (made with chickpeas; both dips have sesame paste - tahini - and other ingredients, including garlic); pita bread; Greek salad; and plain couscous. My students also made delicious chocolate baklava! I thought that I would make a roasted beet and potato dish, so took golden beets, separated the roots, coated the roots with a little bit of olive oil, and set them to bake at 425°F in a shallow plate for about 40 minutes. I added to the oven another shallow plate about 15 minutes later (so it had 25 minutes or so to cook), this one consisting of halved Russian fingerling potatoes that I had first put into a container along with a little olive oil and diced rosemary and shaken. I had forgotten, however, that I had a photography meeting tonight, so simply turned the heat off at that point and came back 2 1/2 hours later; the beets were fine, but the potato a bit dried up. No matter, it ended up tasting fine, especially after adding some canned imported crispy onion pieces. Yesterday, we went out to see a Durham Bulls baseball game. It was after 9p when we left (tied and in the 14th inning, as I recall! ), and we walked right across the street and had (rather mediocre) pizza from Mellow Mushroom (we just had them not add any cheese and had already found that their crusts are vegan). I took the beet greens, removed the stalks and cut them into 1" lengths, and tore the leaves into thirds. I began sauteeing a sliced apple-sage artisanal vegan Field Roast Grain Meat Company sausage. When it started browning, maybe in 3-4 minutes over medium heat in a cast iron pan, I added the stalks and cooked them for 4-5 minutes. Then I added the greens and cooked just for 2 minutes or so. I mixed in some salt, black pepper, and Eat in the Raw's Parma! vegan "Parmesan cheese". I came up with a dish that my wife and I loved! 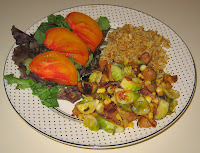 I was going to make a quick and simple dish with Brussels sprouts, and was looking for a grain accompaniment. I decided to use arborio rice, but didn't want to take the time to make risotto. So I tried this. In a saucepan with a little bit of olive oil on medium-high heat, I sauteed a medium shallot that I had diced into small 1/4" squares. After just a minute or so, I added some arborio rice and stir fried it for about 2 minutes till most of the kernels had significant clear areas. Then I added water to equal 2 1/2 times the volume of rice, a cube of vegan bouillon, a cube of frozen basil (1 teaspoon fresh), and some chopped oregano and basil from my garden. I brought to a boil then simmered, covered, for about 20 minutes. By then, the liquid was absorbed and the grains looked nicely plump and moist. I mixed in 3 diced slices of sundried tomatoes and served, with some vegan Parm! "Parmesan cheese" on top. I started with the Brussels sprouts and decided to use the Brussels sprouts and beets preparation that I came up with exactly two months ago as a model. This time, in a cast iron pan with a little olive oil, I started browning halved (larger ones I actually cut into thirds) Brussels sprouts for a few minutes, then added large chunks of marinated garlic (maybe 3 cloves). I had saved one steamed golden beet from Monday; I made 1/2" cubes and added them a few minutes later, along with some chopped rosemary needles. I continued to cook for a few more minutes, then transferred everything to a large bowl. I mixed in a few tablespoons of Baja Lime marinade, prepared fried onion pieces, salt, freshly ground black pepper, and a few small halved green olives. Both dishes were good. The arborio rice was not as creamy as risotto, but almost as tasty! This was a good discovery - when one doesn't have time to patiently stir, this is a nice, easy alternative to making risotto! I'll have to add the description to my self-published cookbook. I was busy preparing my monthly film review column and haven't been shopping for a few days. 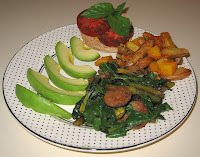 My wife and I went for a bicycle ride and picked up a few ingredients, including an avocado and broccolini. I cut tempeh into thin 1/2" squares and sauteed for several minutes till brown on both sides, then added a bit of onion and, cut into approximately 1" segments, broccolini. 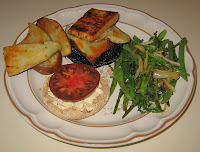 I sauteed for a few more minutes and served, along with a hot French dinner roll with grilled vegetable bruschetta topping. I was busy with my photography business and getting material together for my film review column in Saathee Magazine, so wanted to put something together that would be fast and require minimal cooking. I preheated my oven to 425°F and took advantage of having frozen breaded eggplant slices on hand (available at Whole Foods Market). I sprayed a little extra virgin olive oil into a baking dish then put in slices (which were quite large) of eggplant, covering the bottom. I sliced most of a small onion into very thin slices and spread those slices atop the eggplant. I used two links of Field Roast "Grain Meat" [my quotes] Company's vegan apple sage sausage and sliced them into 1/4" rounds, and spread them on top, as well. I added a little bit of bottled mixed grilled vegetable bruschetta topping as well. Finally, I had leftover heirloom tomato and eggplant-tomato sauces that I had recently made and mixed together, and spread this sauce on top. I baked the casserole dish, covered, for about forty minutes. In a saucepan, I made a simple orzo side dish by putting in rainbow (naturally colored with vegetables) orzo and four times as much water, as well as a cube of vegan bouillon, and brought to a boil, then lowered the heat and simmered, covered, for 10-15 minutes. The liquid should have been absorbed, but it wasn't and I drained off a little bit. I also served some raw slices of rutabaga - this is the first time that I've purchased this vegetable. We loved the casserole! I don't take much credit, but chalk this winner up primarily to the breaded eggplant. The orzo was also good; I had wanted to zest some lime into it, but didn't have a lime. It's been such a long time since I've had the pleasure of making a meal! We had a great time at the Full Frame Documentary Film Festival (you can read my descriptions of each of Thursday, Friday, Saturday, and Sunday at the Festival), watching probably 25-30 films. On Thursday, we ate at the opening night party - most of the items at the banquet were vegan, as it turns out! 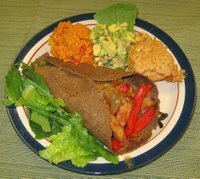 (The food was catered by Café Parizäde, who hosts our annual vegan Thanksgiving.) On Friday, we ate at Tosca Ristorante, where we had a few eggless vegan pastas to choose from, and enjoyed angel hair - my wife had a tomato-based one, and I had an oil and garlic one with artichoke hearts. On Saturday, we ate at the Festival (Café Parizäde was cooking outdoors and we had a salad and fruit), and yesterday we took three Basque filmmakers out and ate at Spotted Dog in Carrboro, where we had some salads, beer-battered fries, and a tempeh dish. Today, I cooked, with a vegan bouillon cube, brown basmati and a little bit of red rice mixed in. 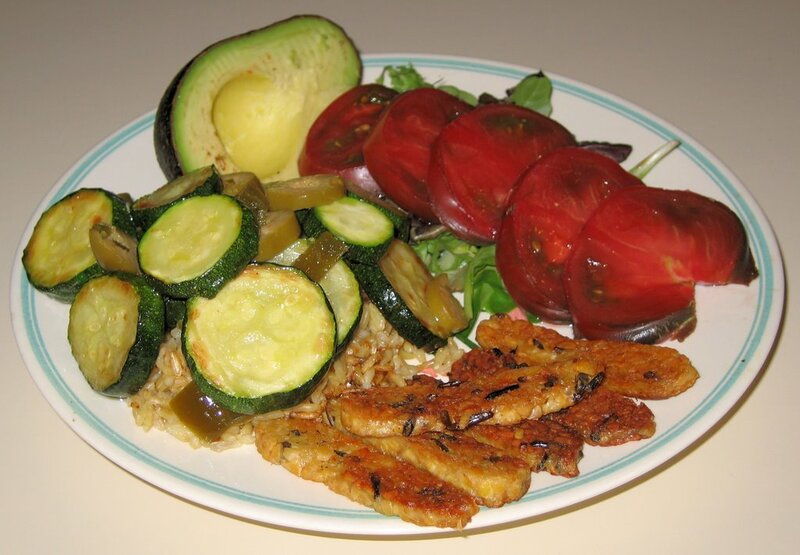 When it was done, I mixed in vegetables that I had sauted - coarsely chopped onion, poblano pepper, and approximately 3/4" long sliced green beans. When the vegetables were almost done, I mixed in a bit of turmeric and cumin seed and then turned the heat off and added a few tablespoons of Baja Lime marinade, as well as a little bit of crushed red pepper (the poblano was quite mild) and salt. I also served some flame-roasted corn that had vegan margarine (our staple, trans-fat-free Earth Balance), lime juice, and salt mixed in. I had also steamed golden beets, and served them, sliced, with a little bit of salt. The sauce that I started yesterday cooked all day in the slow cooker on low from around 8:10a-7:10p. My wife was still at work then and the sauce was smelling done since maybe 5:30 or 6 and in fact had a bit of a burnt smell, so I went to exercise and turned the temperature down to warm - we didn't eat till a little after 10p! In fact, though the sauce was good, it was probably the least interesting sauce that I have made. I would next time go for about 10 hours. I also grilled some big stalks of purple asparagus; it is pretty but loses its purple color as it cooks. I served the asparagus with fresh squeezed lemon and salt. I grilled some large chunks of white mushrooms and, when they were lightly browned, poured a little Baja Lime marinade on top, as well as salt and pepper. This is likely my last dinner I'll be cooking till Monday or even Wednesday, as we'll be at the Full Frame Festival tomorrow through Sunday. We have an invitation to eat out on Monday but I mentioned that we will probably be tired of eating out. Tuesday is my cooking class. In tonight's cooking class, my students made delicious fajitas out of seitan (wheat gluten), bell peppers, and onions, and enjoyed them with either new hemp tortillas that I found a few days ago (nice but they didn't hold together) or sprouted grain ones. We were to make guacamole, but the only avocadoes that I could find were fairly firm, so they made a tasty avocado salad. Their quinoa with leeks came out nicely, and everybody loved the cornbread - I bought hempmilk as an ingredient (usually I use rice milk), and it was a winner, as it was in the delicious "perfect" potato soup! Their orangey rice pudding was very tasty, and we also had champagne mango pieces. I'm preparing for pasta tomorrow - I'm overdue for using my slow cooker again! I saw some heirloom yellow tomato sauce in the store and decided to try making my own; the sauce that I saw was quite liquidy and really not that expensive (around $7 or $8 for a large jar - heirlooms are expensive and the tomatoes would cost that much alone to make that much sauce), so I may still buy it in the future to mix in with a chunkier base that I'd make with my cooker. 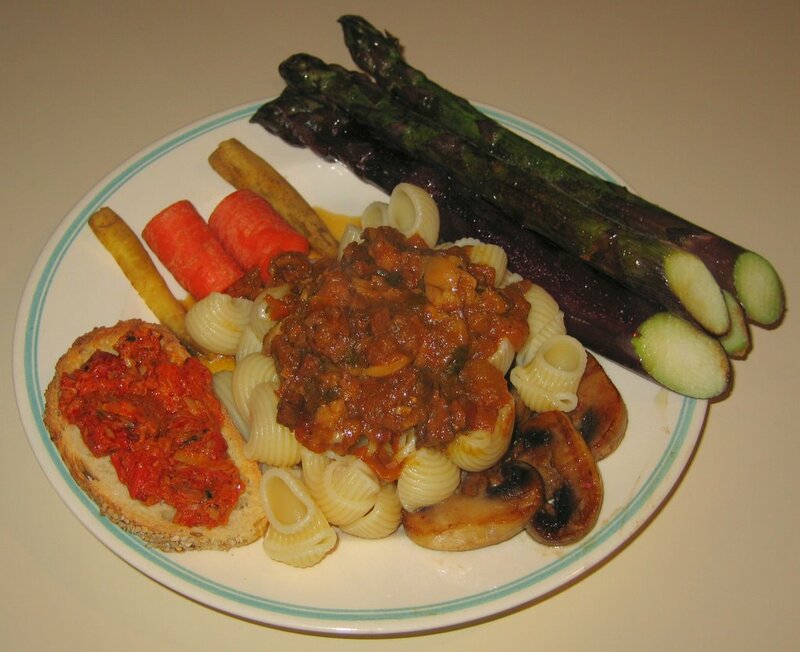 I thought I would do three things differently from my previous pasta sauces. 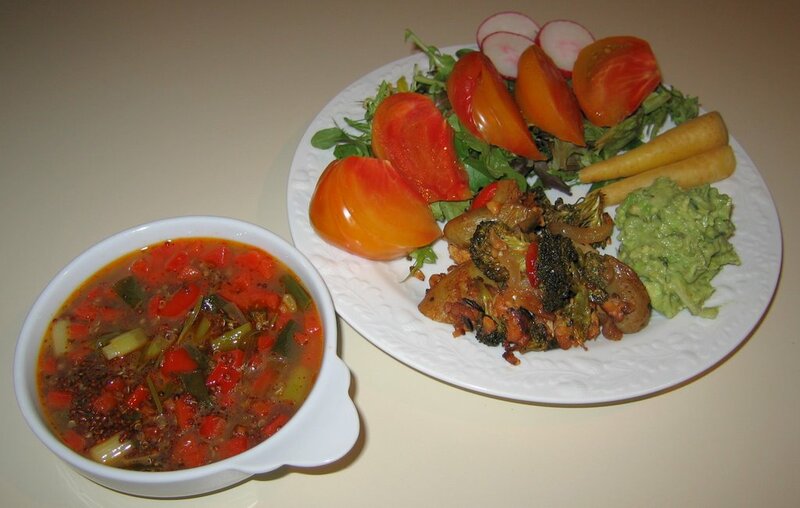 Instead of using roma tomatoes, I used yellow-red heirloom ones; the taste is fabulous, so the sauce should be great. Instead of sauteeing the other ingredients, I put them all in raw - a few cloves of elephant garlic, finely diced; end pieces, diced, from Field Roast's handmade stuffed vegan (with apples, squash, and mushrooms) Celebration Roast (I was slicing it for making sandwiches for a lunch meeting my wife is attending for work tomorrow); and olive chunks, a few tablespoons of olive oil, fresh oregano, and 2 frozen teaspoons of basil, all of which, of course, I don't cook anyway, as well as a little salt. I can't remember what the third difference is, so it is probably not significant. I wonder if the sauce will be too garlicky, but somehow I think it will be quite good - this slow cooker seems to be able to do no harm :-) ! I've never sauteed carrots, but read that they taste good prepared in this way. So I decided to give this a try with baby round yellow carrots that we had picked up on Saturday. I sauteed in a little bit of oil in a saucepan, an onion that had been sliced into maybe quarter-inch thick half-moons, just for a few minutes till the onion started losing its whiteness. Then I added the carrots that I had sliced into thirds, stirred, then reduced the heat to low and covered. I checked after 5-7 minutes and when I found that the carrots had softened (I think it was about 7 minutes), I added half of a thinly sliced jalapeno as well as spinach leaves that I had hand torn into halves. I sprinkled some salt on top of the leaves, mixed, and covered, keeping the heat on low-medium. I mixed every few minutes till the spinach cooked down in about 7-10 minutes. I served this over mashed potatoes. I had picked up a prepared asparagus salad, and served that, as well. Yesterday I did two extensive back-to-back photo shoots, totaling over 1100 images in about 4 hours. I wasn't tired and was interested in making dinner, but my wife, who helped, was tired and wanted to eat soon, so we went out to Sitar India Palace and had good South Indian food. I'm going through a short period where we are eating out significantly. Yesterday, my Mom invited us to enjoy some of her homemade pizza, which she hasn't made in a while. On Thursday, I was helping a vegetarian society friend with ideas for his new Six Sigma business and was treated to a nice dinner of homemade bread, salad, and a delicious stew of lentils, potatoes, and kale (I'll try something like this in my slow cooker); they also served some tasty raw dessert, spheres formed by nuts and frozen organic berries, with flaked coconut on the outsides. Tonight, I heated leftover Indonesian Sate Vegetables from last Friday. 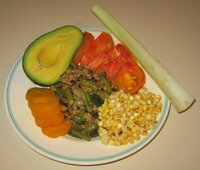 I was going to make a nice heirloom red quinoa dish by sauteeing briefly some scallions and red bell pepper chunks, along with maybe 1/2 teaspoon cumin in the last half minute, then adding quinoa and water in a 1:2 ratio, along with a vegan bouillon cube and a little salt, fresh rosemary, and chili powder. I brought it to an uncovered boil and then lowered the heat to a simmer for about 5 minutes, then removed it from the heat and let it sit, covered, for about 10 minutes. I must have added too much water as it was quite liquidy - but the telltale spiral in the quinoa grain was showing off its doneness, verified by my tasting it. It tasted great and the broth was very good, so I served it as a soup! The salad included heirloom tomatoes and baby white carrots. I made guacamole (my students will be making guacamole and a quinoa dish, among others, in Tuesday's Mexican cooking class) as well - my secret is adding some rosemary. We enjoyed the dinner! We ate out with friends last night at Xiloa Nicaraguan Restaurant near Duke University. We like their variety of vegan selections and their delicious fresh juices. The dish that my wife ordered (guiso, I think), came with rice that had olive slices and capers mixed in - tasty! That gave me an idea for tonight's dinner. I was very sleepy as I only had three hours sleep last night, squeezing in photographing an event and a portraiture in two days with other pressing items, so wanted to make something easy. I had the idea to simply saute thickly (a little larger than 1/4") sliced zucchini for a few minutes till very slightly brown, then mix in thickly sliced olives stuffed with jalapenos. I served that on brown basmati rice. 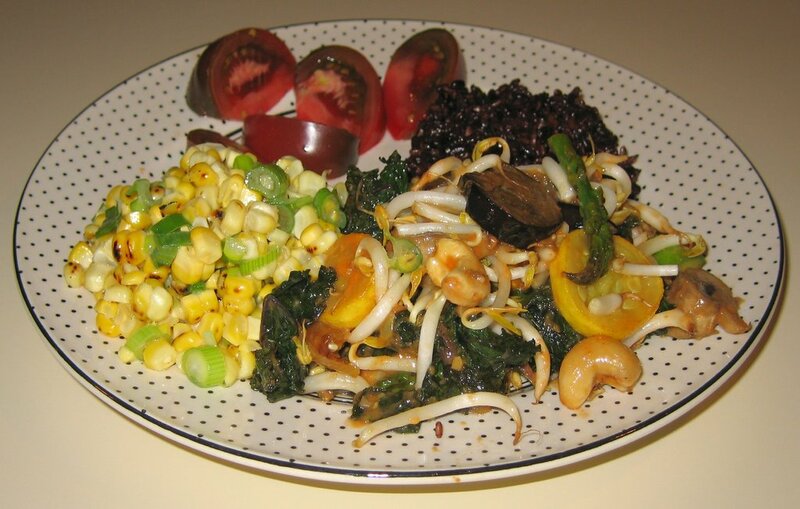 I sauteed some tempeh, then drizzled on some vegan "liquid smoke", as a side dish. I liked dinner but my wife needed some more seasoning on the zucchini; a little bruschetta topping did the trick for her. I had to use up the peanut satay sauce not used from Friday. What I did was saute in canola oil half of a large onion, cut into thin half moons, then halved again. A minute or so after adding the onions, I put in thinly (maybe 1/4") sliced eggplant, skin intact. 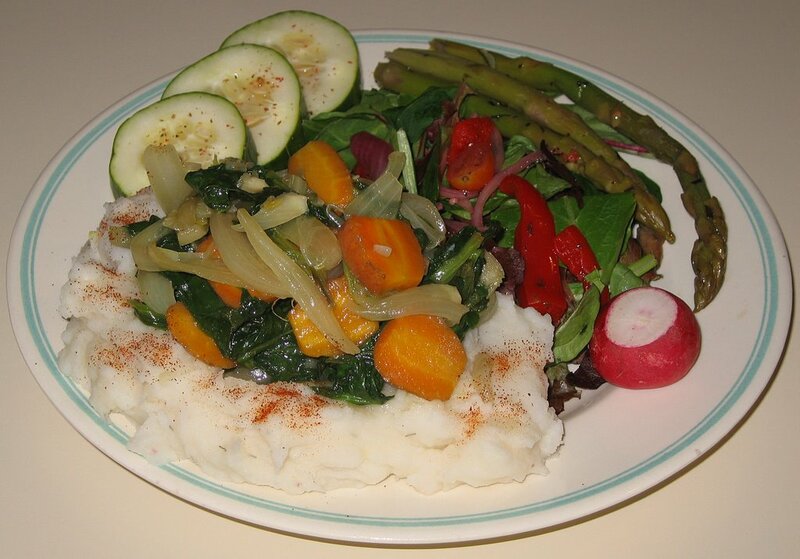 Several minutes later, I added yellow squash, also sliced thinly, as well as asparagus cut into 1" segments, as well as coarsely hand-shredded red kale leaves, diced jalapeno, and diced ginger. As the kale cooked down over about 5 minutes, I added raw cashews for another few minutes, being careful that the cashews didn't burn. I then removed from the heat, mixed in the satay sauce, mung bean sprouts, and salt, and served. I also made some rice. 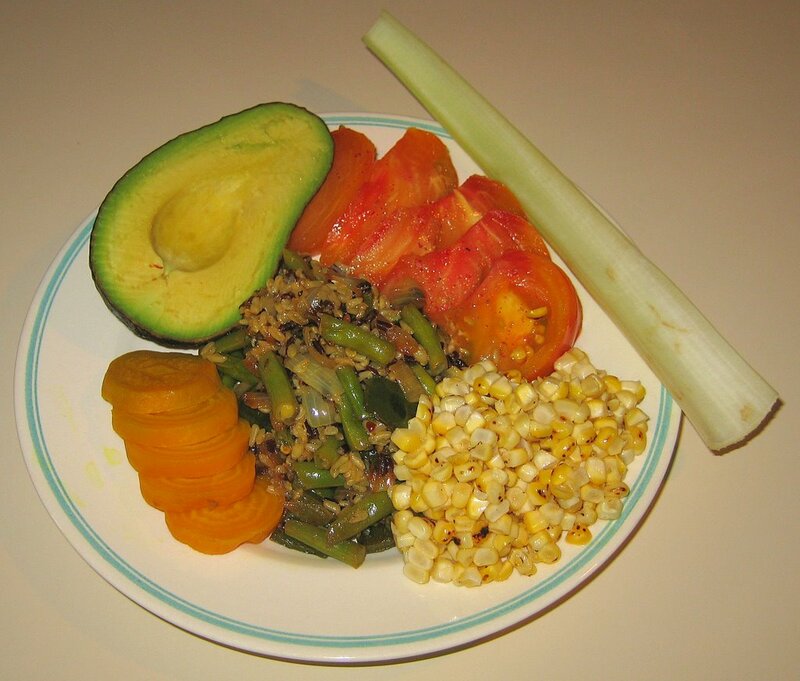 I was excited at the store today to find organic bi-color corn, so grilled three ears on my gas range, stripped the kernels, and mixed in fresh lemon juice, salt, and three thinly sliced scallions. Yesterday, we ate out. I was busy in the garden, fertilizing and then mowing the lawn. Before we knew it, it was after 9p (tonight was another unusually late dinner with us both out till after 9) and I needed some groceries for breakfast this morning, so we made a quick trip to the grocery store then had pizza at a sports bar downtown called Satisfaction that is supposed to have excellent pizza. They were very accomodating to make a cheeseless pizza and cut it with a clean cutter, but I found the pizza only to be somewhat middling. The crust was thin, as I usually prefer it, but some cornmeal that can be used to help the dough slide out of the oven would have added a nice grittiness. The sauce was too lightly coated, but the biggest issue was the toppings, which were mediocre. Granted, we were one of their last orders of the day and they expect people to try the pizzas with cheese; I might be willing to try them again. We have a friend in town from South Florida on business; she flew in today and we weren't sure if she would be joining us for dinner tonight, but it turns out she couldn't - but we're seeing her tomorrow night. As much as I'd love to cook for her (and three friends that she's bringing along), I am photographing an event and want to maximize her time so that I can show them Duke Gardens and Chapel Hill/Carrboro, so we're likely going out to Xiloa in Durham for Nicaraguan food. My wife is away for part of the weekend, so I made a simple dinner for myself. I have plenty of sauce leftover from dinner a few nights ago, and am thinking of making pizza soon. But the sauce was too runny, so I took most of the liquidy portion of the sauce with a little bit of the "chunk" and heated it, mixing in some chopped olives. I served it over trofie pasta. 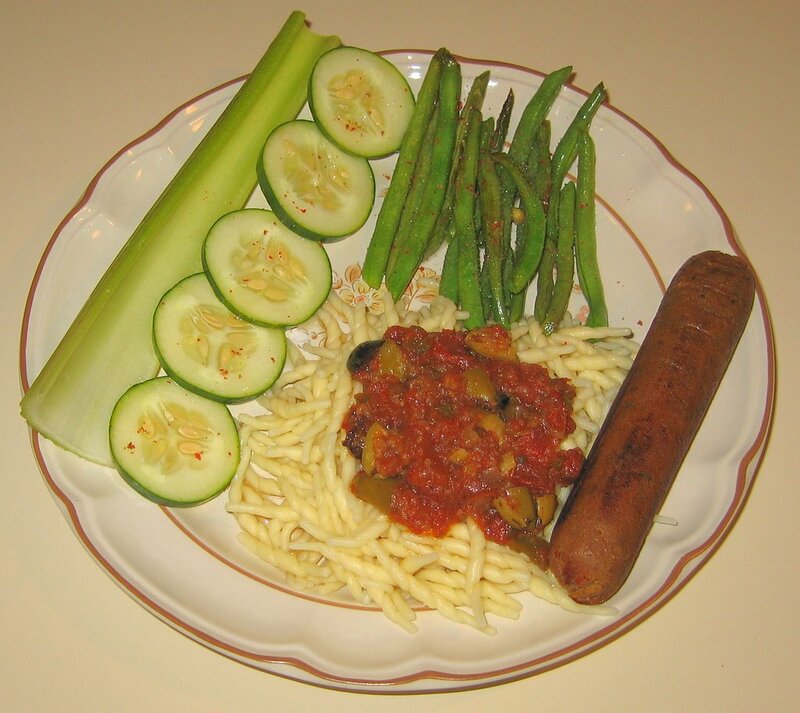 Neither my wife nor I generally like food that looks like meat, but we love the all-vegan and non-soy products from Field Roast Grain Meat Company, such as their apple-sage artisanal sausage. I grilled a sausage (these are consistently excellent, but today it ended up being a little bland; I know the owner of the company so will drop him an email about this) as well as green beans in a little bit of olive oil. Like the pasta dinner a few days ago, I served the beans with fresh lemon juice, salt, and pepper.